What you’re looking at isn’t some craft plying the wastes of the outer planets. It isn’t a particularly confusing sculpture a billionaire has commissioned. 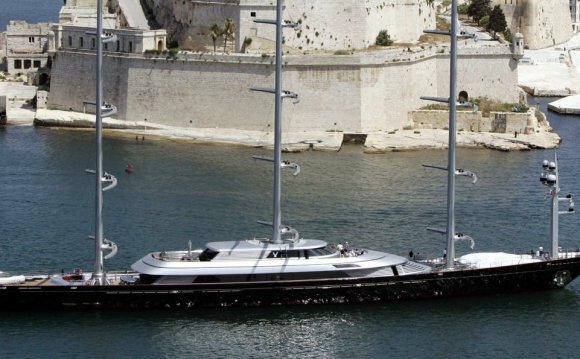 What it is, rather, is a particularly confusing megayacht a billionaire has commissioned. Please welcome Sailing Yacht A.
UPDATE: This post originally referred to the big boat as the White Pearl, but a spokesman for its owner wrote in to say that it is not the named the White Pearl Sailing Yacht A. When I asked where the name White Pearl came from, he said that “it comes from some local journalists in Kiel near the shipyard who kept calling it this name.” But that is definitely not its name. It is just Sailing Yacht A. That’s it. Sailing Yacht A also serves as a nice compliment to Melnichenko’s non-sailing boat that just has a couple of engines, Motor Yacht A. That ones looks less like a spaceship and more like a badass knife, which is something we would like to have, please. The boat, purchased by Russian industrial billionaire Andrey Melnichenko for the rock bottom price of just about $400, 000, 000, is 468 feet long, 300 feet high, and sports an underwater observation room, because no yacht is really a yacht without an underwater observation deck, according to the United Kingdom’s Metro. Seen departing for its sea trials from the shipyard in Kiel, Germany, where it was built, it also weighs 14, 224 metric tons. For comparison, I once went in a sailboat during summer camp when I was about 12 and I’m pretty sure that in a rush to get it back to the dock after the lightning warning sounded we capsized it immediately, proving that the supreme desire for survival and life is ultimately fruitless as we strive to forestall our final demise.